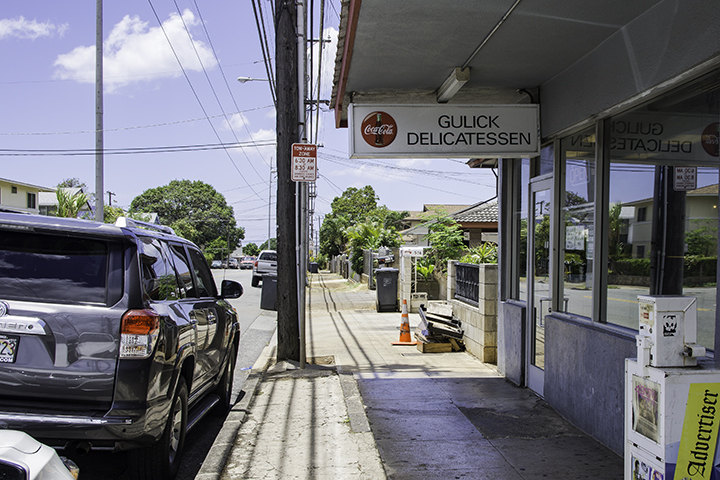 One of the classic mom and pop places in Honolulu, Gulick Delicatessen. Many places throughout America have mom and pop places that are popular among local residents. Hawaii is no different. What’s different about Hawaii is that, in many instances, you can’t find places like these anywhere else in the country. Despite their unremarkable outward appearances, these establishments serve outstanding food and snacks at very reasonable prices. In fact, many of these mom and pop outlets have high ratings on consumer review websites, such as Yelp. Here is a sampling of such mom and pop places in Honolulu. 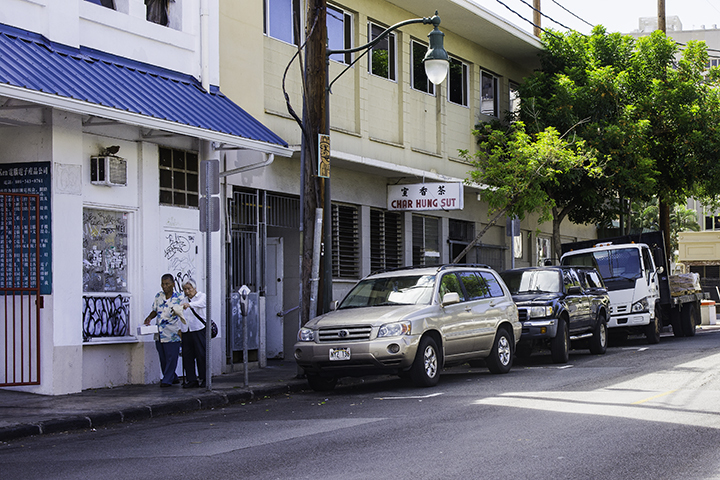 In the Kalihi area of town, there is a famous local delicatessen on Gulick Street. It’s the iconic Gulick Delicatessen. It’s not like the kind you see elsewhere in the US. But sadly, this delicatessen might be one of the few local delicatessens left in Hawaii. In the old days, there were many delicatessens like this in Hawaii. Such places sold local Japanese style take out lunches. Examples of dishes sold in places like this included rice balls, beef teriyaki, corn beef hash patties and potato salads. Gulick Delicatessen retains much of this colorful old style tradition. This is another mom and pop store in the Kalihi area of town. 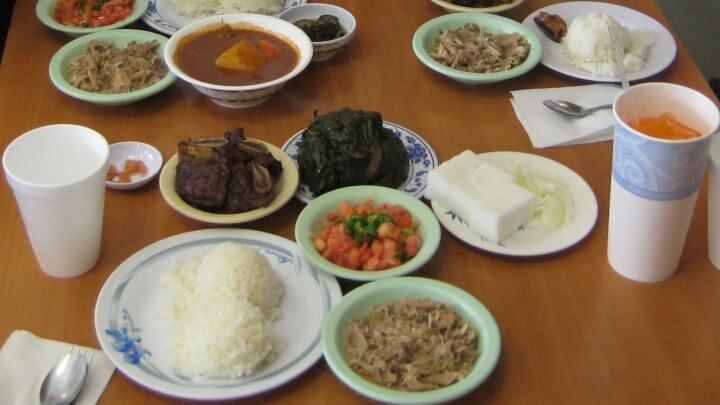 It serves what people classically know in Hawaii as plate lunches. It’s a favorite dining place among locals for dishes like poke. Poke is raw tuna chunks that places like this mix with seaweed, onions and spices. It’s also famous for plate lunch selections like roast pork, furikake (spiced seaweed) salmon and laulau (steamed pork and spinach). When you talk about traditional Hawaiian food, Helena’s Hawaiian Foods in Kalihi is always a part of the conversation. Its humble surroundings belie the fact this restaurant was a recipient of the prestigious James Beard Award in 2000. The Food Network also featured it on one of its shows and numerous celebrities regularly frequent it. If you like Japanese rice balls, which Japanese know as onigiri or musubi, then this is the place for you. The rice, which the store wraps in seaweed, is exquisitely soft and flavorful. It comes with a wide assortment of fillings like ume (pickled plum), salmon flakes or ikura (salmon eggs). You can find this place in a tiny, unassuming alley in Waikiki. It also serves an assortment of Japanese-style take out lunches, which people call bentos. Honolulu has a number of places that serve this unique Hawaiian snack, shave ice. Shave ice traces its roots to Japan. 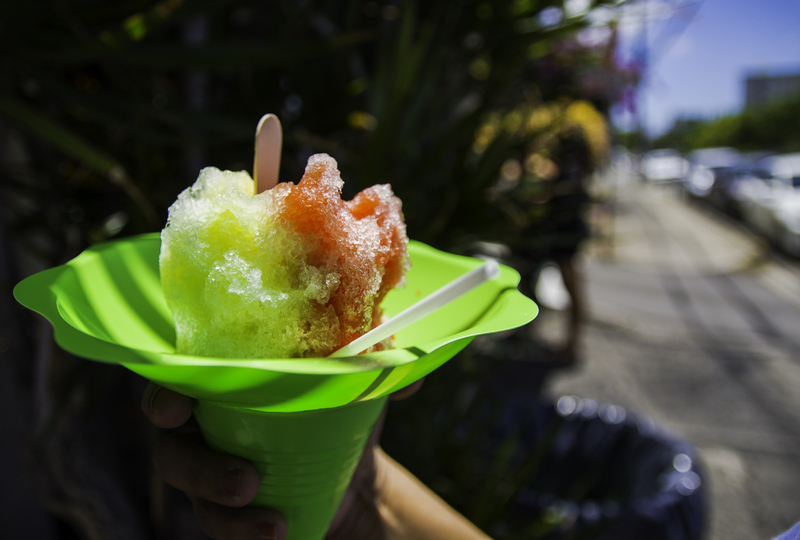 As its name suggests, the ice for shave ice is shaved, not crushed as in the case of snow cones. Waiola Shave Ice in the Mo’ili’ili section of Honolulu, serves up a wide assortment of shave ice flavors and types. Hawaii has many places specializing in Hawaii’s version of ramen, which locals call saimin. It might be hard for people to articulate the difference in taste between ramen and saimin. But whatever the case, Palace Saimin just might serve one of the best saimin in the Aloha State. This small and humble establishment in Kalihi focuses only on saimin. Here, you can also get traditional saimin accompaniments like teriyaki barbeque sticks and cone sushi. As in the case of saimin, Hawaii also has its own version of Chinese dim sum, which people call manapua. Some of the typical manapua you can find here are the store’s version of char sui bao (pork filled bun). There’re also pepeiao (shrimp dumpling), pork hash (pork dumpling) and sweet rice cake. Char Hung Sut has been a Chinatown institution for generations now. It’s been the go to place for manapua for many Honolulu residents. Char Hung Sut, another one of the great mom and pop places in Honolulu. Another popular place serving delicious shave ice is Shimazu Store in the Liliha area of Honolulu. It serves the standard flavors like strawberry. But it also has rainbow as well as a wide range of exotic syrups like lilikoi and mango. Word of this store has reached out far beyond the State of Hawaii. So much so, the Travel Channel once featured it in one of its shows. Shave ice from Shimazu Store. This small but popular market in the Palama area of town is primarily a seafood store. But it also sells classic pupu (appetizer) dishes in Hawaii. Such dishes include poke, Okinawan sweet potatoes, Hawaii-styled boiled peanuts and sashimi (sliced raw fish).